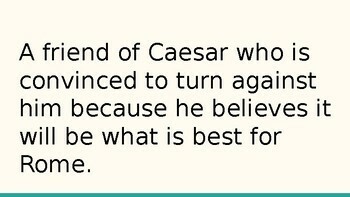 Have you ever noticed that there are SO many characters in Julius Caesar? My students were having trouble keeping track of them, so we decided to give each character a clever nickname as a mnemonic device. Voila! 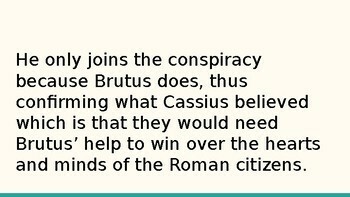 Suddenly "Backstabbing Brutus" and "Cynical Casca" are impossible to forget. 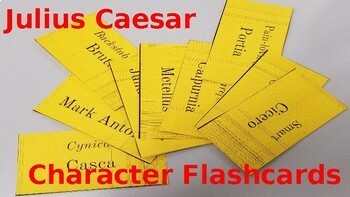 This Power Point can be printed as a handout with 4 slides per page so that students can create their own set of flash cards to review characters. It could also be printed and used as a matching game. 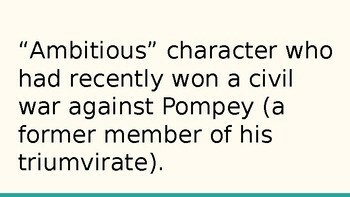 Or, if you prefer, you can simply use it as a Power Point and have students take notes as you introduce the characters. Really, the possibilities are endless.